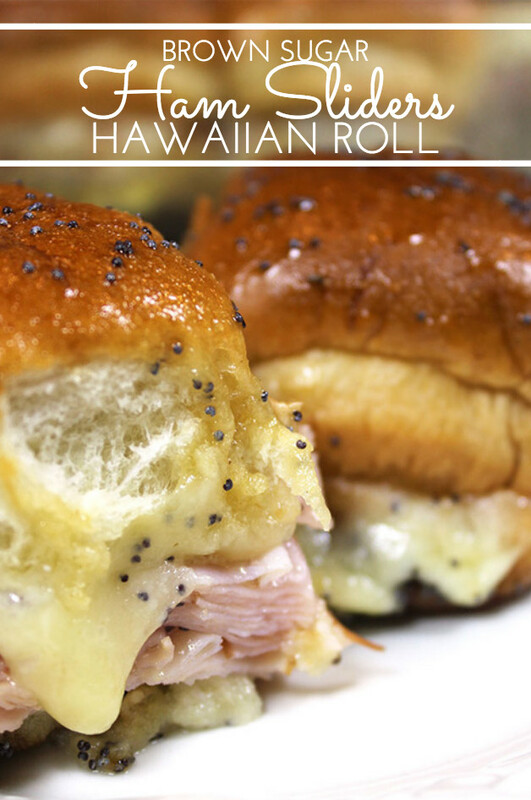 You’ll love these Brown Sugar Hawaiian Roll Ham Sliders w/VT Cheddar! 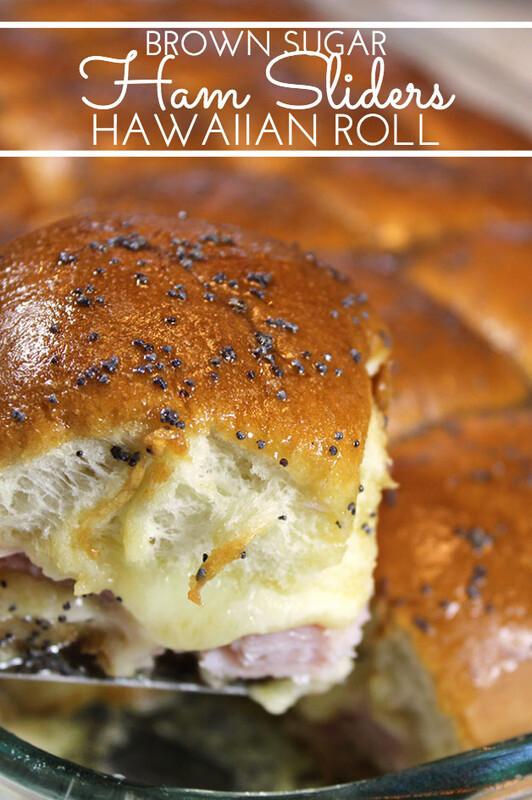 Layer sweet Hawaiian rolls with sliced ham and VT cheddar cheese. Then brush with a sweet and spicy brown sugar glaze and bake. Heaven on a plate! So easy, serve these sweet and spicy slider sandwiches piping hot. They’re irresistible crowd pleasers, ideal for picnics, parties and tailgating this season. This summer was one of the best I can remember in a long, long time. We packed in a lot of new and different things. I’ll fill you in more about it in a personal post soon. 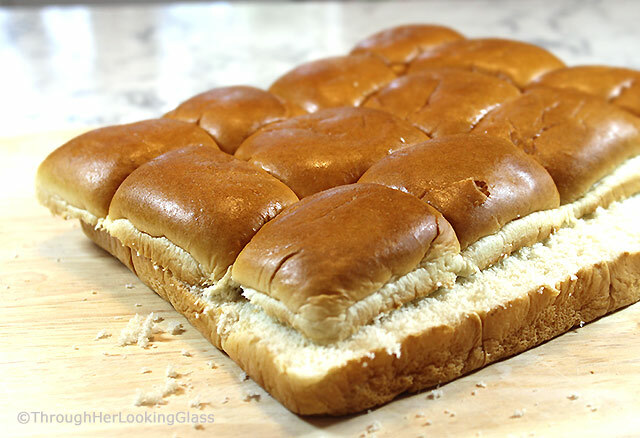 Split the store bought Hawaiian rolls in half horizontally. One very special thing we did this past summer was join my aunt, cousin and family up at their lovely summer cottage on Joe’s Pond in Danville, VT for a long weekend. 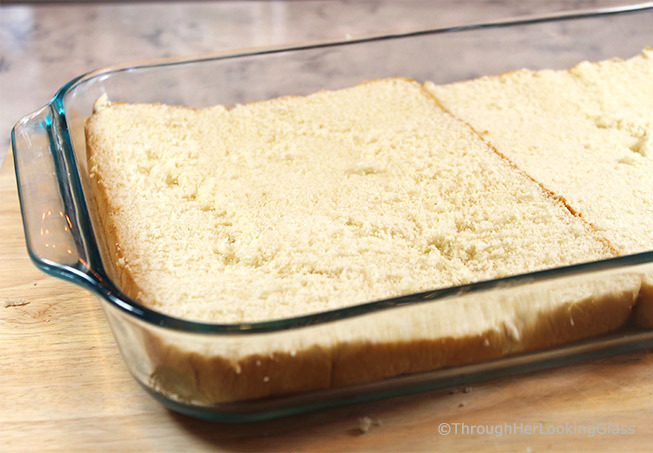 Fit bottoms into a lightly greased 15″ X 10″ pyrex pan. The cottage has been in my extended family for as long as I can remember, maybe even before I was born. And it holds many sweet memories through the years. We held family reunions there, and our various families rented cottages around the lake. 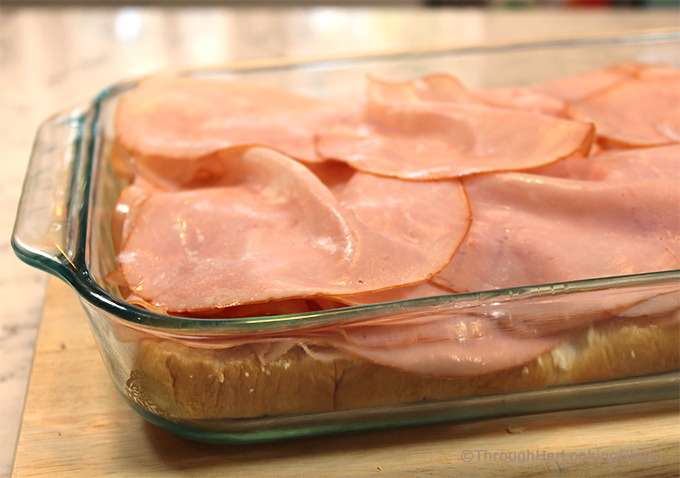 Layer thinly sliced ham on top. During the daytime, we’d hike, fish, sail, water ski, chat and play tennis. Evenings, we gathered together for gourmet meals at a different cottage each night, often taking canoes, motorboats or kayaks across the pond to get there. 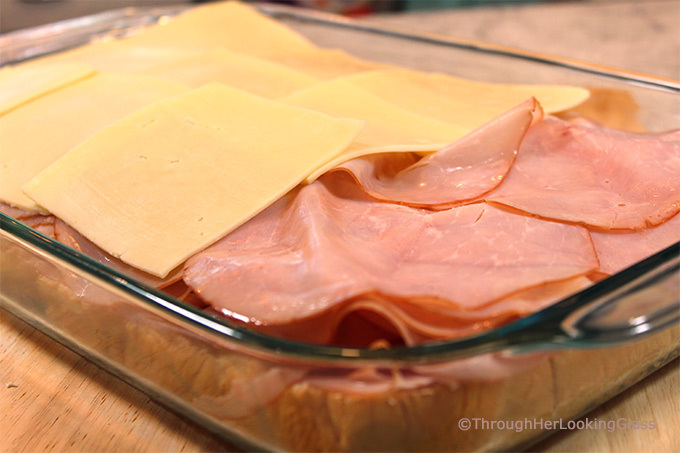 Layer sharp cheddar cheese slices on top of the ham. After dinner, various teams washed and dried, stories were told, songs harmonized and games played with much laughter and hilarity. This is what I remember from our sweet times together growing up. Pour sweet and spicy butter sauce over the sliders. A highlight of spending time with my extended family is always the excellent food. My mom, aunts and cousins seem to instinctively know how to make wonderfully delicious meals with fresh ingredients that feed multitudes. It must be in the genes. This past summer was no exception. Up at the cottage, we were treated to a number of scrumptious new recipes. 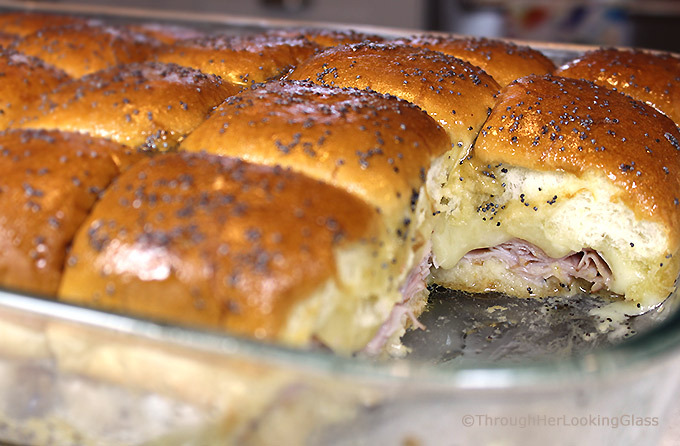 On Sunday morning after church, my aunt made us these fabulous Brown Sugar Hawaiian Roll Ham Sliders w/VT Cheddar I’m sharing with you today! So delicious and easy to make. 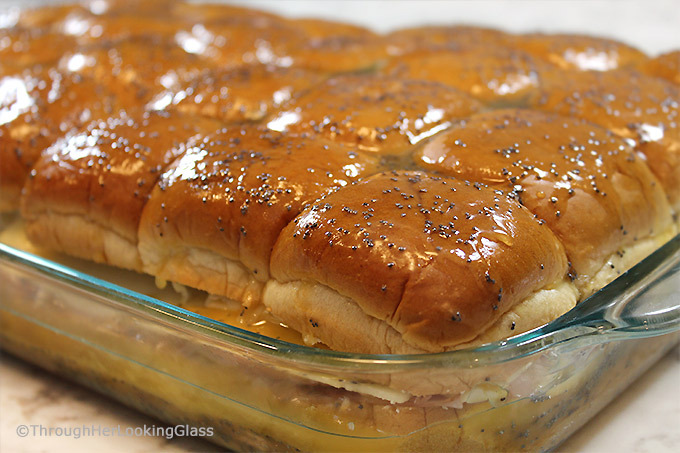 You basically layer a generous ham and cheese sandwich on store-bought King’s Hawaiian rolls. (Or generic Hawaiian rolls work too). Then brush with the sweet and spicy sauce. The sauce is made of melted butter, brown sugar, dry mustard, Worcestershire sauce and poppy seeds. Bring. It. On! My Charlie (12) loves these sliders so much. Weeks after we came home, he was still bugging me to ask my aunt for the recipe. She kindly shared and we had them here for a party last weekend. Big hit, and no surprise. Hope you enjoy them too! I had good luck using both a serrated bread knife and a serrated electric knife to cut the rolls in half horizontally. It was tough to slice through the individual sandwiches for serving once they were baked. (The ham is so thick, not complaining or anything.) But a sharp pair of kitchen shears cut cleanly through the hot sliders without squishing them. Other yummy ham and cheese recipes to try: Ham and Cheese Breakfast Casserole , Savory Ham and Cheese Pancakes, Easy Ham and Cheese Stuffed Crescents. Fit bottom halves into a lightly greased 4 quart, 10" X 15" Pyrex dish. Layer ham, then cheese onto bottoms. Finish off with roll tops and set aside. Whisk together melted butter, brown sugar, poppy seeds, dry mustard and Worcestershire sauce. 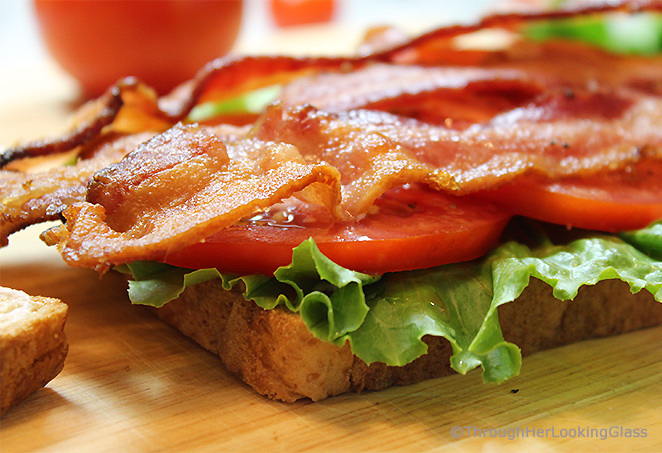 Pour/brush mixture evenly over tops of sandwiches. Cover very tightly with foil. Bake covered at 325° for 25 minutes. Remove foil and bake for an additional 5-10 minutes until golden brown. YUM!! Your flashback story brought back lovely memories of time spent with dear family members on The Pond. Your description of this delicious lunch, brunch or after school sandwich made me add the ingredients to my shopping list. Hot, Cheesy and Delicious! These look really yummy, and I so agree that your family has a beautiful ability to feed lots of people...and with so much love. :) I will definitely need to "invest" in another kitchen tool! I am so glad you had such a wonderful summer, the time spent at the cottage sounds like a dream. 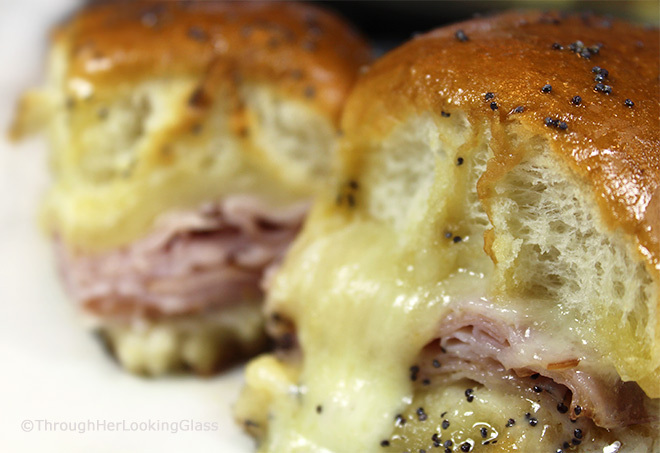 :) And these ham sliders!!! I have never had anything like it, well, this kind of bread is not something I could buy in Germany, but I am already thinking what kind of bread I could use instead or if I should bake my own. I imagine this bread to be very soft, a bit like hamburger buns maybe? Fantastic recipe! I love the idea of the sweet/savoury butter all over the buns. This taste ham and cheese to the next level! These look sooo delicious, and easy, Allie! I plan on making them-- thanks for sharing! Allie, these ham and cheese delicacies look SO good! They seem very versatile. Make them for your family meal, to bring to a party, football gathering or just to snack on. I will definitely be making these tasty morsels!! I want to compliment you on the beautiful photography in this post. You are just great at food photography!! Wow!! I love hearing about your special memories of growing up. The Vt. cottage sounds just lovely. Thanks for sharing!! We have these at our family reunion every year and they are a hit! I'm sharing this recipe with our son. 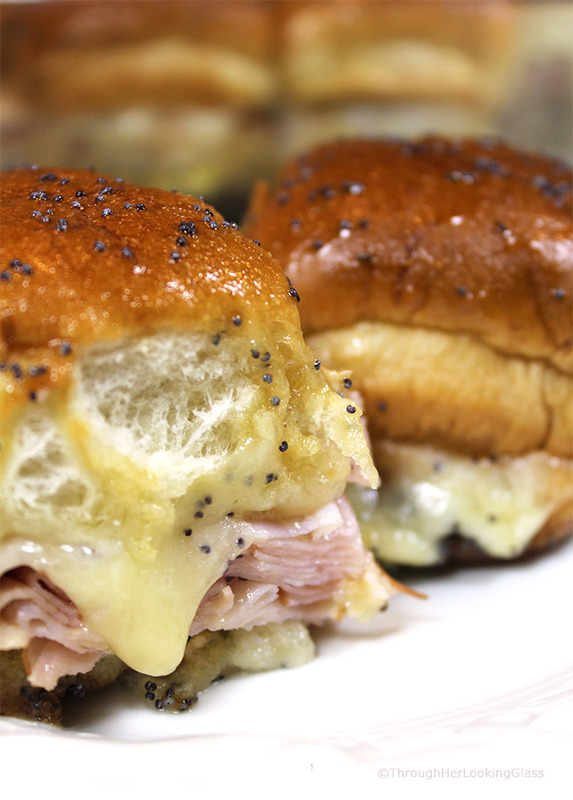 He always makes sliders with leftover honey baked ham the day after Thanksgiving. I know he will enjoy this version. Made these today & they were a huge hit with our entire family. Serves a large bunch which is so convenient. The sandwiches had such a great flavor. This will definitely go in my recipe file. Thanks so much. Hey Megan, so glad! 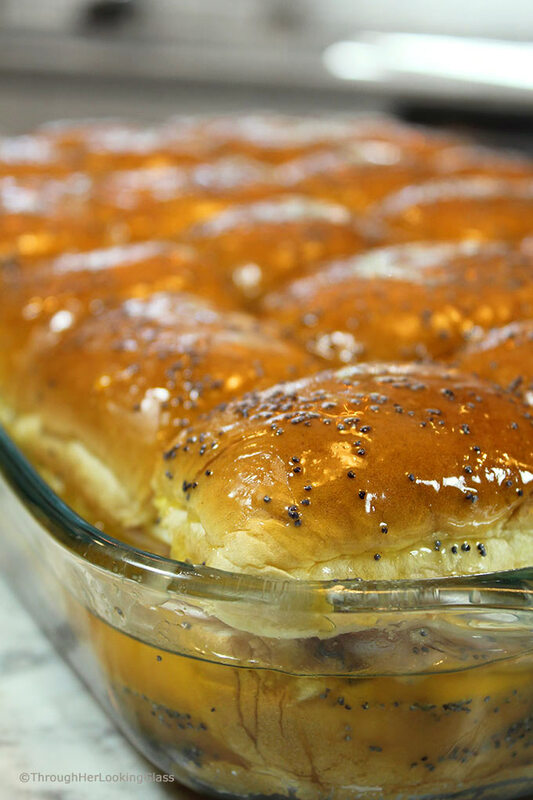 Today I actually brought these ham sliders to a friend who just had a hip replacement, along with some Maple Pumpkin Bisque (just published here on the blog.) It was a nice combination for fall. Many thanks for dropping by. Soulful . Keep sharing more delicious recipes with us. Hi Megan, Could you please tell me what VT cheese is....and if I don't have that, what would a good substitute be? I just ate these at a Baby Shower and they were so delicious!! Thanks so much! !